Salt has played such an important role in human history. Did you know salary is derived from the same root as the word salt? We all need a certain amount of salt in our daily diet to maintain good health. You can pull minerals from natural salt not available in commercial table salt. After table salt is “chemically cleaned” you end up with sodium chloride. This is a chemical your body does not recognize and it is common in processed and fast foods. It is best to change your table salt in for a natural salt for you and your family. You will actually begin to love the taste of natural salt. If you have been a table salt abuser, you may find once you stop using it your food tastes better. Why not try some natural salt for 30 days? Have fun in the process, there are loads of healthy good tasting salts available. Real salt is available in powder, granular, kosher, and course grinds. Soul of the Sea. Kilauea Black is one of the few black gourmet sea salts available. This salt is made using mineral rich Molakai sea salt and activated charcol – a proven anti-toxin and digestive aid. 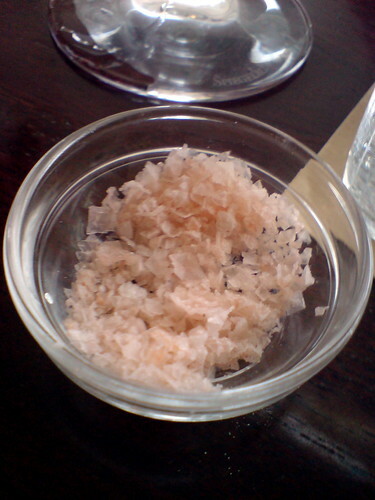 While considered a gourmet salt, Himalayan pink salt can be used to replace table salt. Its taste and eighty-four minerals make this salt more flavorful and healthier than processed salts. A culinary bouquet of chopped fresh sage and rosemary with moist, crunchy Flor de Sal (Portuguese Sea Salt). Gorgeous salt packed of green flecks. So fragrant and evocative, you won’t know if it is Thanksgiving or if you are in the Mediterranean. Use with seafood, lamb, pork, poultry, rice, potatoes, stuffing, focaccia before baking, winter squashes, tomato dishes, eggs, Italian dishes, cooked apples or pears. Mix with olive oil and use as a rub. My favorite. Organic, Raw Sea Salt From Prehistoric Sea Beds. Unprocessed sea salt from ancient unpolluted sea beds. Unlike commercial salts, which are highly heated, damaging its chemical properties. No “flow” or “anti-clump” additives unlike many salts with toxic additives. Rich in trace minerals. I have used this salt for over a decade, I promise you will love it! My intent is to help those who are addicted to table salt move into using a more natural salt that their body can really use. Whatever natural salts you try, I hope you like them!